We continue our feature of the KGFS study and follow from our previous post, which mentioned how KGFS researchers are tackling problems with collecting self-reported agricultural data by using a harvest diary. The greatest challenge we faced was in designing a harvest diary to suit our needs. 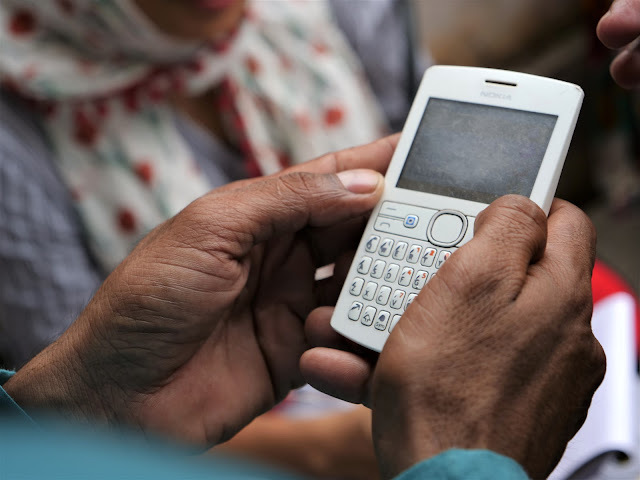 In a diary based survey, the design plays a huge role in determining if we are able to collect any usable information. A poorly designed diary can demotivate respondents and reduce compliance rates. 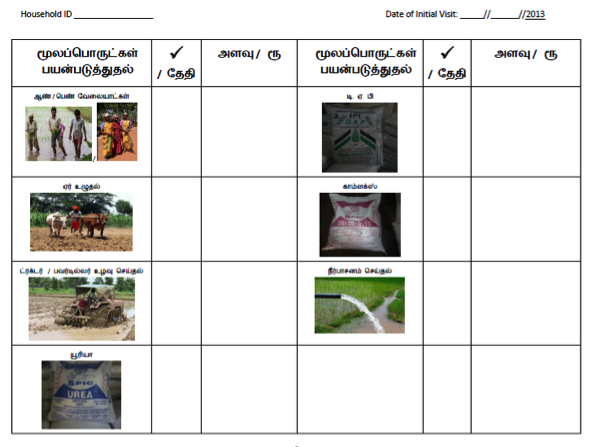 We required a harvest diary that covered various farming practices throughout the paddy season in a manner that was both generalizable to all farmers and flexible enough to account for individual delays/modifications, and at the same time was intuitive to the farmers’ understanding of the crop cycle. We also wanted to make it approachable to illiterate respondents, yet at the same time, have the capability of collecting information in a manner usable for quantitative analysis. 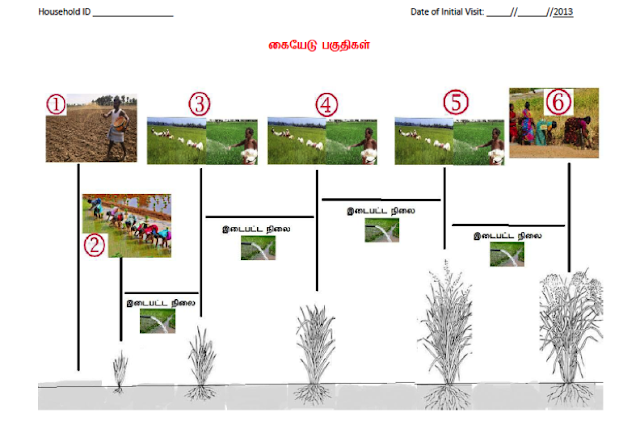 We went about this process by initially conducting a few exploratory surveys in order to better understand the various stages in the paddy growth cycle and how farmers thought about and planned these activities. This basic understanding helped us map the season as a combination of major events and minor repetitive activities. We also found that farmers counted their schedule in terms of the number of days since sowing/transplanting as an indicator for subsequent input applications. Although delays were inevitable, there was more or less a general agreement on this day-based schedule, and we decided to incorporate this into the diary, rather than go by a regular calendar-based diary which would be tedious to follow. We were thus able to map the sections of the diary as shown below. And the minor phases captured repetitive irrigation expenses, sporadic pesticide/weedicide applications as well as loans taken. The difference between the major and minor phases were that major phases tended to happen in a single or couple of days and involved a range of inputs and were generally scheduled events, while minor phases were drawn out over many days between two major events and involved both repeated and unscheduled activities which could not be captured in a rigid timeline. We had different page designs for major and intermediate phases. The major phase pages were numbered according to the map and collected information on usage of every single input involved in one major activity. The intermediate phases collected information on the frequency of application of unscheduled or repetitive input applications. Respondents were required to write the quantity and value used (if known) and the date of usage (if known). If they had difficulty in filling any of these details, we provided them the option of just scoring a tick mark next to the input used, so that we can use it to guide their recall when we make a revisit toward the middle or end of the season. We also provided a blank space for them to write free-hand, any information that could not be captured in the predesigned format or in case they could not follow the predesigned format. 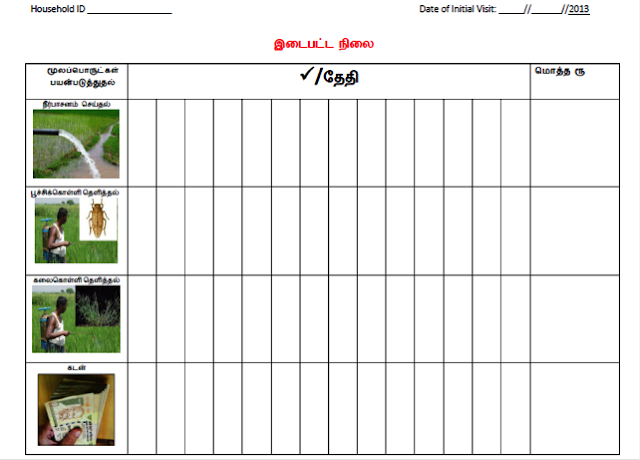 Using this design, we were also able to minimize the number of pages in the diary. The next installment in this series will look at some of the lessons we have been able to learn since the pilot rolled out in the beginning of September.